Spirit Rover Mountaintop View - Solar System Planets And Moons Section. Mini-panorama taken by Spirit. Image credit: NASA/JPL. NASA's Spirit rover has reached the summit of Husband Hill, and is now taking some time to enjoy the view. After climbing for months, the hardy rover is now 106 m (348) feet higher than it was when it first landed. This view from above gives mission planners a chance to analyze the terrain in all directions and decide where to send Spirit next. Working atop a range of Martian hills, NASA's Spirit rover is rewarding researchers with tempting scenes filled with evidence of past planet environments. "When the images came down and we could see horizon all the way around, that was every bit as exhilarating as getting to the top of any mountain I've climbed on Earth," said Chris Leger, a rover planner at NASA's Jet Propulsion Laboratory, Pasadena, Calif. The summit sits 82 meters (269 feet) above the edge of the surrounding plains. It is 106 meters (348 feet) higher than the site where Spirit landed nearly 20 months ago. Spirit and twin rover, Opportunity, successfully completed their three-month prime missions in April 2004. They have inspected dozens of rocks and soil targets since then, continuing their pursuit of geological evidence about formerly wet conditions on Mars. "Spirit has climbed to the hilltop and looked over the other side, but NASA did not do this just to say we can do it. The Mars rovers are addressing fundamental questions about Martian history and planetary environments," said NASA's Mars Exploration Program Director Doug McCuistion. The crest of "Husband Hill" offers Spirit's views of possible routes into a basin to the south with apparently layered outcrops. Shortly after Spirit landed, it observed a cluster of seven hills about 3 kilometers (2 miles) east of its landing site. NASA proposed naming the range "Columbia Hills" in tribute to the last crew of Space Shuttle Columbia. The tallest of the hills commemorates Rick Husband, Columbia's commander. Volcanic rocks covering the plain Spirit crossed on its way to the hills bore evidence of only slight alteration by water. When Spirit reached the base of the hills five months after landing, it immediately began finding rocks with wetter histories. "This climb was motivated by science," said Steve Squyres of Cornell University, Ithaca, N.Y. Squyres is principal investigator for the rovers' science instruments. "Every time Spirit has gained altitude, we've found different rock types. Also, we're doing what any field geologist would do in an area like this: climbing to a good vantage point for plotting a route." Researchers are viewing possible routes south to apparently layered ledges and to a feature dubbed "home plate," which might be a plateau of older rock or a filled-in crater. The landing site and the Columbia Hills are within Gusev Crater, a bowl about 150 kilometers (95 miles) in diameter. The crater was selected as the landing site for the Spirit rover because the shape of the terrain suggests the crater once held a lake. Volcanic deposits appear to have covered any sign of ancient lakebed geology out on the plain, but scientists say the hills expose older layers that have been lifted and tipped by a meteorite impact or other event. "We're finding abundant evidence for alteration of rocks in a water environment," said Ray Arvidson of Washington University, St. Louis, Mo. Arvidson is deputy principal investigator for the rovers' science instruments. "What we want to do is figure out which layers were on top of which other layers. To do that it has been helpful to keep climbing for good views of how the layers are tilted to varying degrees. Understanding the sequence of layers is equivalent to having a deep drill core from drilling beneath the plains." Both Spirit and Opportunity have been extremely successful. Their solar panels are generating plenty of energy thanks to repeated dust-cleaning events. Spirit has driven 4,827 meters (3.00 miles), and Opportunity 5,737 meters (3.56 miles). JPL manages the Mars Exploration Rover project for NASA's Science Mission Directorate. 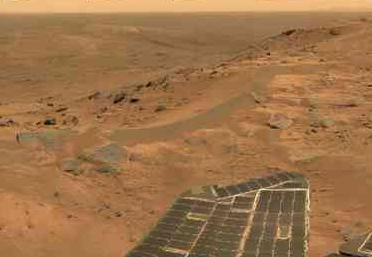 For images and information about the rovers and their discoveries on the Web, visit: http://www.nasa.gov/vision/universe/solarsystem/mer_main.html or http://marsrovers.jpl.nasa.gov.